These pictures are of a frog (Xenopus laevis), a newt (Taricha torosa), a chick, or a mouse embryo. Any additional will be identified. SEM = scanning electron micrograph. 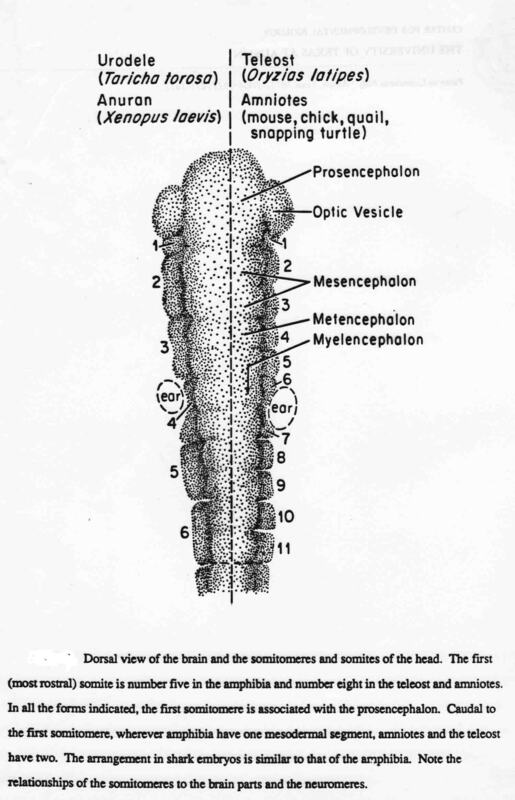 This picture illustrates the position of the notoplate at the midline of the neural plate in newt embryos. The morphogenetic role of the notoplate is described in "Neurulation". 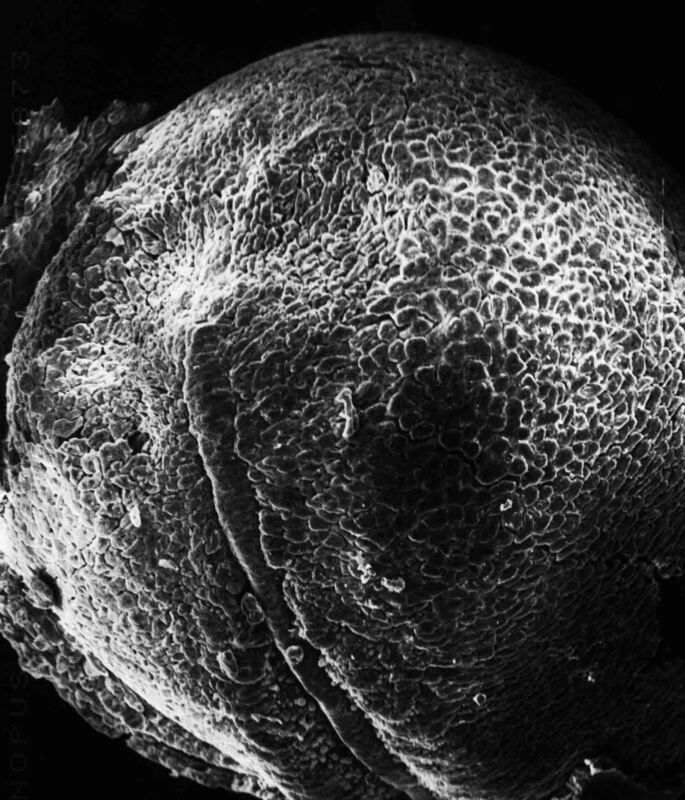 This SEM is a ventral view of a frog embryo in the open neural plate stage. A piece of the notochord was dissected away to show the basal surface of the notoplate. Fibers of the matrix attach the notochord to the notoplate. 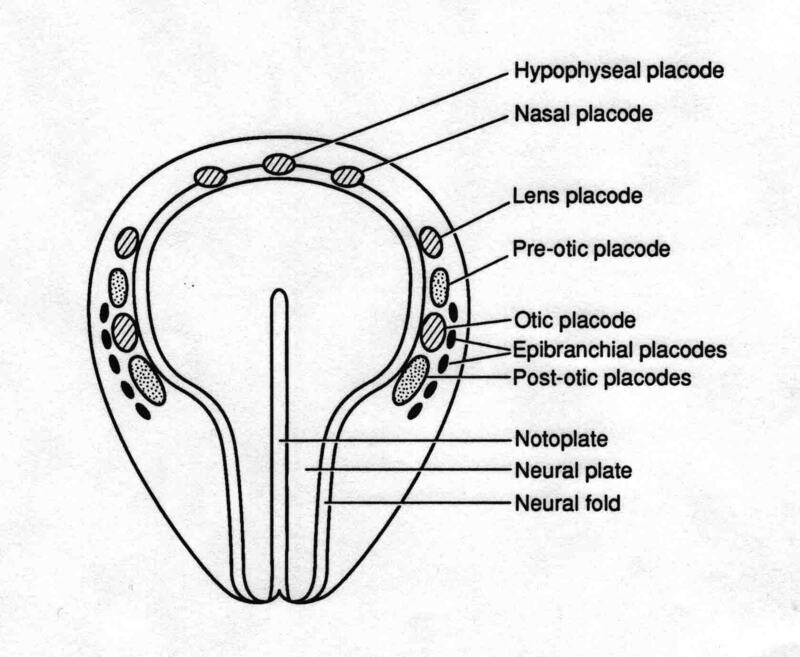 The picture illustrates with some clarity that the notoplate is a separate entity at the midline of the neural plate. Section through the eyes of a newt embryo. One eye has a normal lens, the other has an ear vesicle in place of the lens. At an earlier stage, presumptive ear ectoderm was implanted in place of the presumptive lens epidermis. Section through the eyes of a newt embryo (T. torosa) at stage 40. The head was injected with 1/2 % agar below the right eye at stage 23. The agar prevented eye invagination with these remarkable results. Overview (SEM) of the left side of a newt embryo at stage 34 (see Normal Stages). 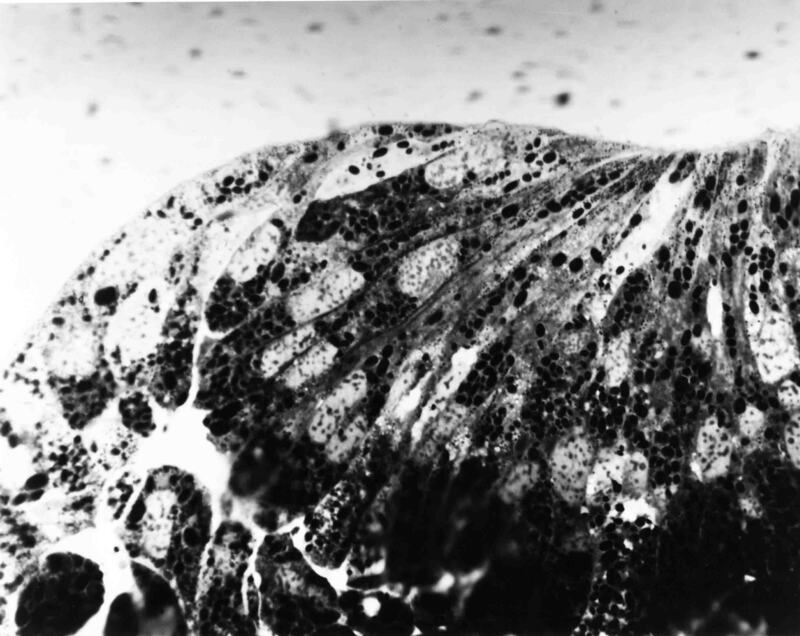 The surface of the embryo is covered with many cilia. The open neural plate has been removed from the top of this frog embryo, revealing the underlying dorsal mesoderm in dorsal view in this SEM. The notochord at the midline ends at the anterior end of the midbrain. Somitomeres are visible to each side of the notochord. In front of the tip of the notchord are the two most anterior cranial somitomeres, with the prechordal plate between them. The forebrain (removed) would overlie these two somitomeres. 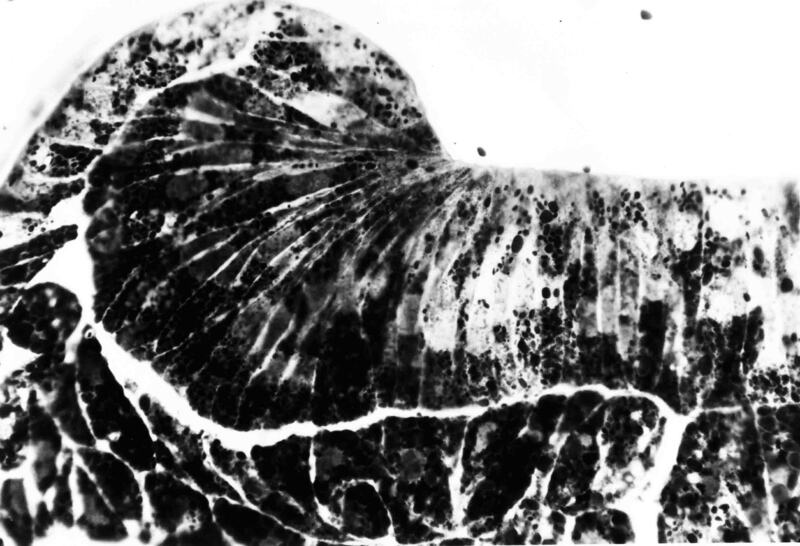 Positions of the epidermal pacodes at the open neural plate stage of a salamander. This is an experiment with a newt embryo at stage 14. 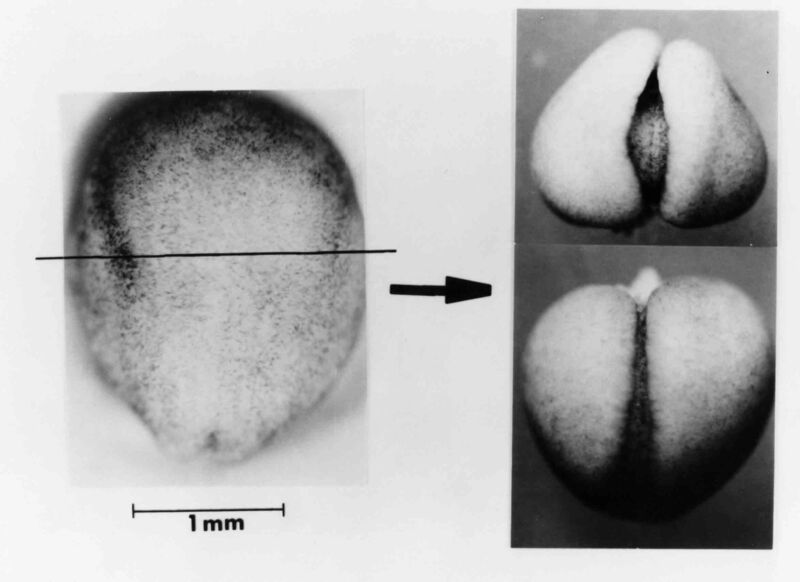 The embryo is bisected at the line and each half then grown in culture to stage 18. Each half independently neurulates. 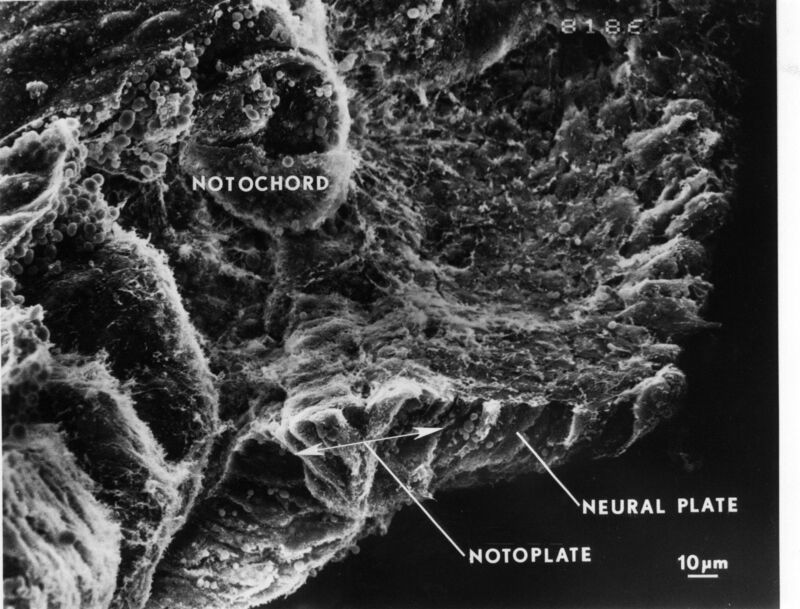 The 'Notoplate" is the group of cells in the neural plate that dirctly overlie the notochord. 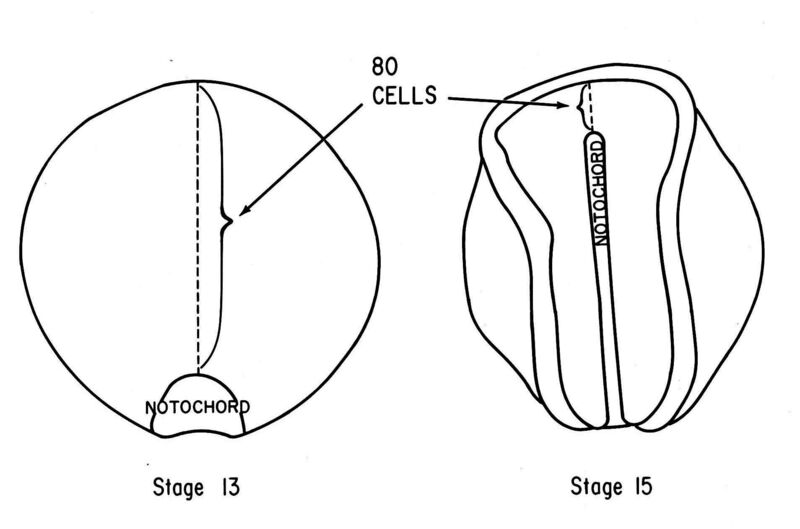 On the figure above, The labels "notochord" should be "Notoplate". 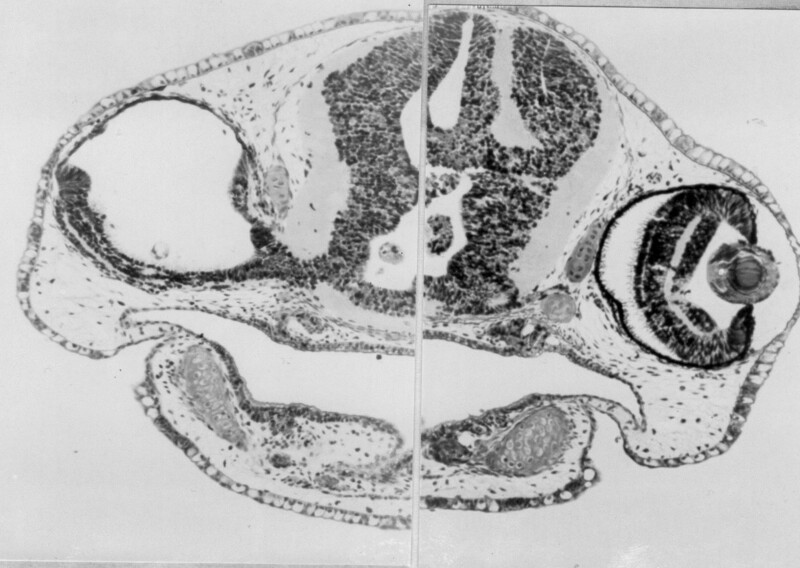 The notoplate cells are shown at stage 13 (left) and at stage 15 (right). The notoplate cells rearrange and greatly help elongate the neural plate during neurulation. Notoplate cells attach to neural plate cells at each side and narrow the width of the notoplate while elongating the midline of the neuralplate. We asked, does the elongating plate advance craniad while pushing aside neural plate cells craniad to the notoplate? I counted the neural plate cells directly anterior to the notoplate and found 80 cells at each stage, so the neural plate cells accomodate the advancing notoplate by changing shape to become much taller cyindrical cells with much decreasd diameters. It is also possible this shrinkage of the neural plate cells aids the advance of the notoplate. 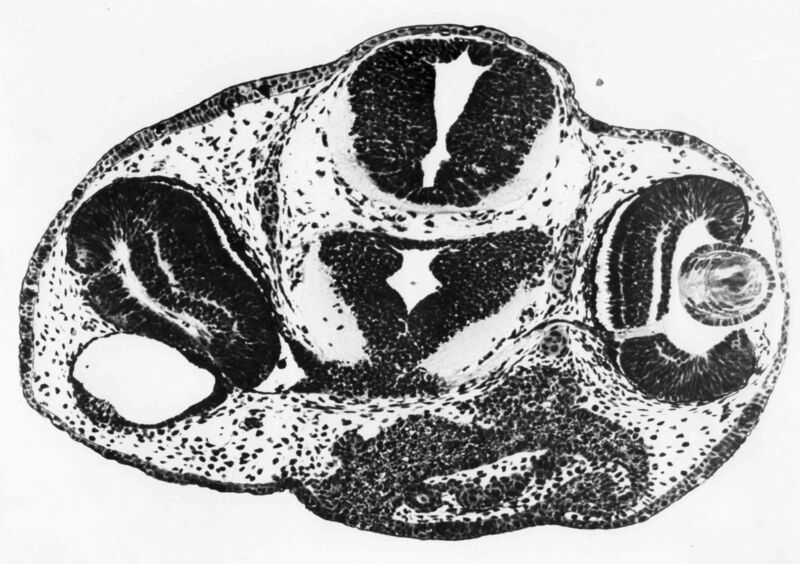 Section through the left edge of the neural plate (T. torosa) at stage 14. This so-called "thick plastic section" is 2 microns thick. Fixation was done on the egg. Individual neural plate cells can be seen for the length of the cell. Basal surfaces of neural plate cells that contact the epidermis lift the epidermis upward. The resulting rolling moment begins the creation of the neural fold. Section similar to the preceding, but at stage 15 when the neural fold is apparent. During neurulation, the nervous system is wrapped round the embryo. Optical foreshortening obscures the total lengths of the nervous systems. 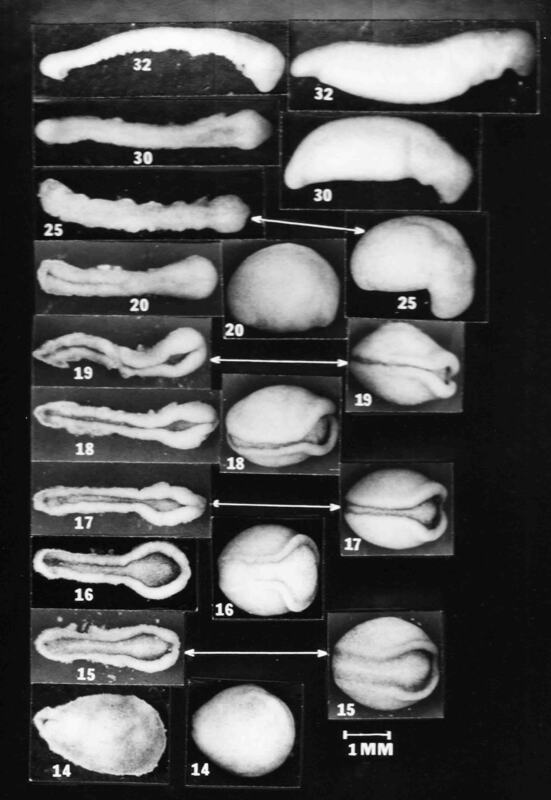 This figure below shows intact embryos at the right and middle, and from the same embryos, their nervous systems dissected out, laid out flat, and photographed immediately (figures at left). The picture below is the undersurface of a chick somitomere. 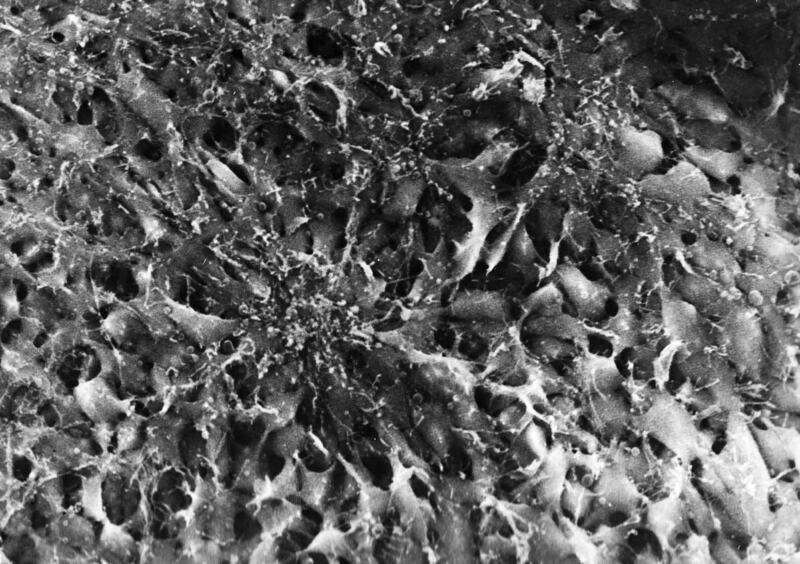 The arrangement of the somitmere cells around the midpoint is especially clear in such SEM's.